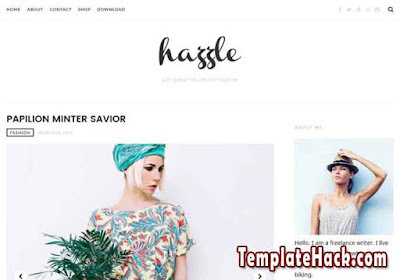 TemplateHack.com - Download Hazzle premium blogger template. Hazzle is recommended fashion blogspot template to applied on your blog. If you have a new blog and will built it to fashion or lifestyle niche, you should pick up this template. Hazzle has responsive design to make your blog can load on any screen size devices. Also, it is has email subscription widget to share your update post automatically by email to your audience. Breadcrumbs, Browser Compatibility, Drop Down Menu, Email Subscription Widget Ready, Fast Loading, Instagram Ready, Mobile Friendly, Post Thumbnails, Responsive, SEO Friendly, Slideshow, Slider, Social Bookmark Ready, Clean, Minimalist, Simple, 1 Right Sidebar, white, 2 Columns, No Column Footer. Beauty blogger template, Daily Blog blogger template, Entertainment blogger template, Fashion blogger template, Gallery blogger template, Lifestyle blogger template, Magazine blogger template, OOTD blogger template, Personal blogger template, Photo blogger template, Photography blogger template, Portal blogger template, Profile blogger template, Recipes blogger template, Reviews blogger template.